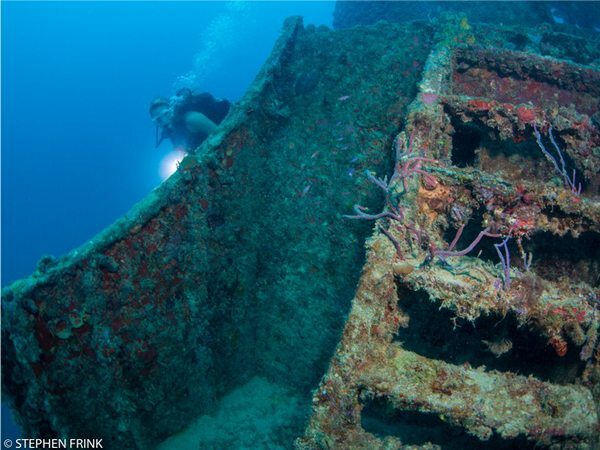 Dive our Reefs & Wrecks! 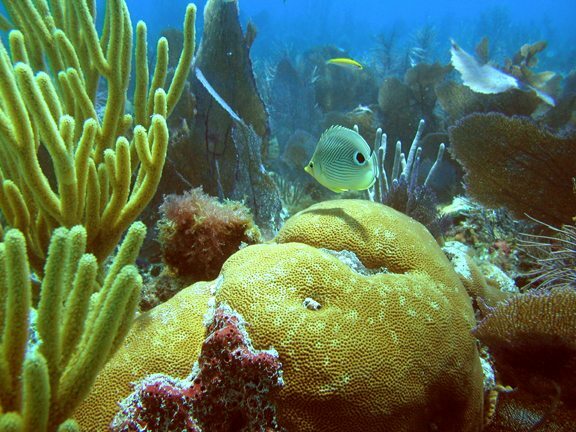 Diving & Snorkeling in the Heart of the Florida Keys…Explore Marathon! 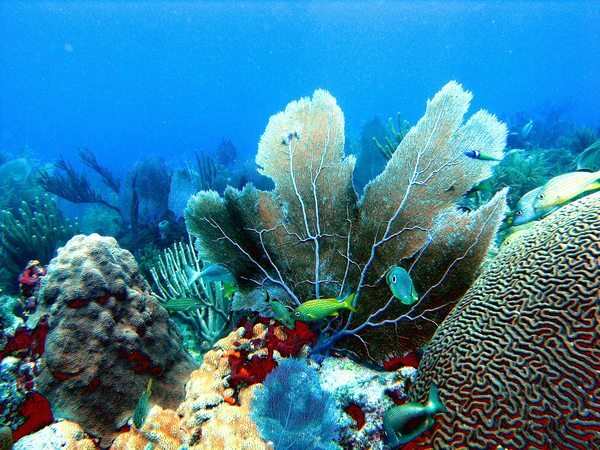 The Florida Keys, with Marathon at its center, offer the best diving and snorkeling in the country for every skill level. 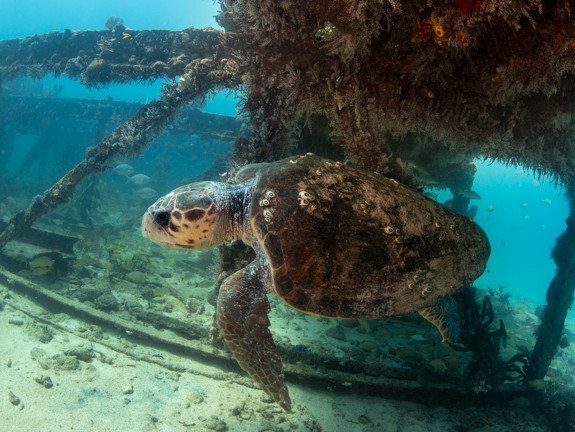 We know that Marathon is not the most well-known diving location in the Keys but we also know that Marathon diving has some of the best diving and is the “Best kept secret in the Keys when it comes to great diving and great dive sites.” The Marathon dive sites offer the diversity to fulfill any diver’s or snorkeler’s fantasy. Being a secret isn’t all bad. Our reefs are less crowded and disturbed. Our partners work together to get you the dive you’re interested in and quite simply, we try harder. So, I think you will be happy with our service. If you want become a diver, Marathon is the perfect place for learning and earning an open water diver certification from one of our highly experienced, professional, yet casual and fun Captain Hook’s staff member. For our advanced divers, Marathon offers fantastic wrecks, beautiful coral reefs, a mind-blowing assortment of tropical fish to see and our experienced instructors can take your dive training to the next level. Our dive service is unique in Marathon…”we noticed that some of our divers had not been diving for a while, so they were a little apprehensive about their equipment, technique and skills in the water.” Often the dive briefing by the captain was missed by the diver because they were concerned about something else. Divers would sometimes go in the wrong direction and miss many of the highlights of the dive site they were on. So, we have added a free divemaster to each dive in the water to guide the dive. Nearly all of our divers were new to the Marathon sites, so why not give them a little assistance in identifying the those highlights and unique features of each site. It is not mandatory to go with the divemaster; you are more than welcome to explore on your own. As a part of our standard service, we are there to help with your equipment set-up and changeover between dive sites. As our customers, we want you to know that we never stop listening and we are always trying to improve. When diving the Marathon reefs, you will notice that the are quite diverse ranging from smaller isolated patch reefs with its own marine residents within Hawk Channel, to great ledges and massive cut-outs along the barrier reef, crammed with all sorts of coral varieties , sponges, invertebrates, large angels and other reef fish. Our dive sites are accessible with a short boat ride to less than 3 to 5 miles offshore with depths that range from 10 to 80 feet. 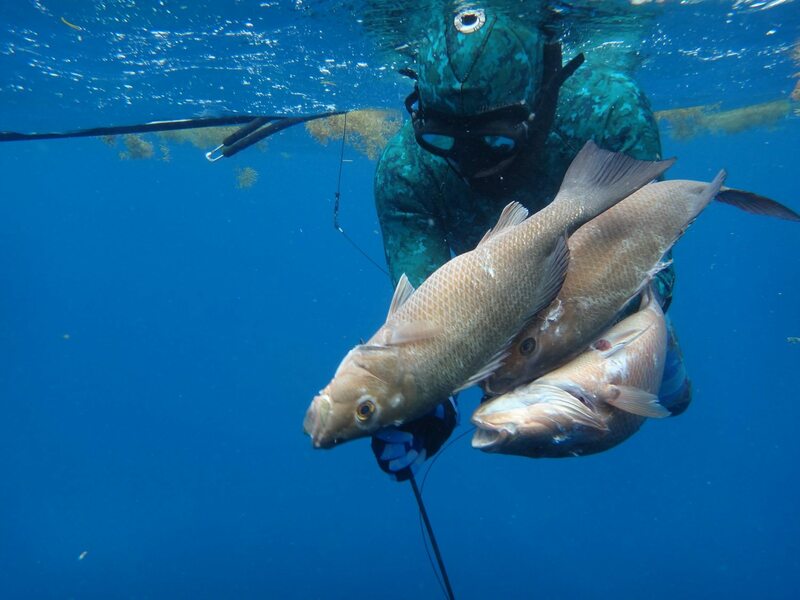 With two major National Marine Sanctuary Preservation Areas, where fishing is outlawed, or limited to catch & release, the fish are plentiful and they grow bigger than they normally would. The Thunderbolt dive is a spectacular dive. With nearly 30 years of marine growth, the T-Bolt has developed a unique and dynamic population, making the site both fun and unpredictable to dive on any given day. The T-Bolt dive is an advanced dive, so you will need to have a number of dives in your log book before you take on this dive. The T-Bolt is positioned upright and fully intact. Penetration of the wheelhouse is simple and easy to navigate with plenty of ambient light pouring through the doorways and windows. Look for big Goliath grouper, barracuda, permit, amberjacks, as well as a whole host of marine sponges, sea fans and other invertebrates. 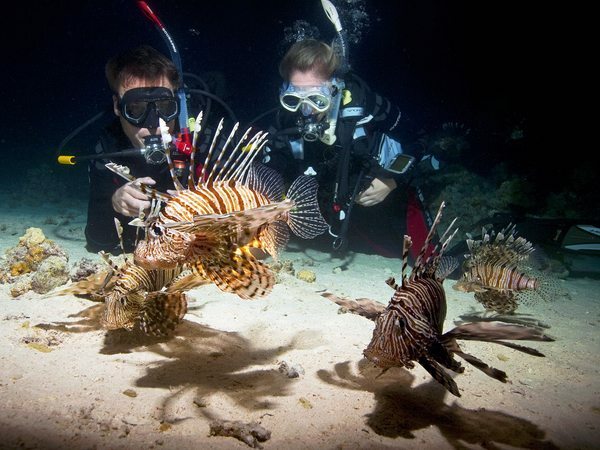 This dive trip combines a late afternoon dive, with a Florida Keys’ sunset, and then a night dive. It can’t get any better than this and it becomes a real learning experience for our divers. Divers witness the unique transformation in the reef that takes place every evening between their first and second dives. After what is typically a brilliant sunset, the surface often becomes a bio-luminenscent dance and nocturnal species that are not present throughout the day, rule the night. Sea turtles, nurse sharks, and moray eels often pay us a visit at night and are fun to follow as we cover the reef. Night time exploration at it’s finest! Reef diving in Marathon is like nowhere else! Voted as one of the best beginning dive sites in the WORLD, it’s perfect for beginners. It also has deeper reefs for a little more of a thrill for you experienced divers. The Thunderbolt is a big time destination for divers from all over the world. This wreck has been the home to all kinds of aquatic life for many years now. It’s also home to some HUGE Goliath Grouper that are must see. The ocean is like another world at night time. Our night dives offer a unique perspective on your favorite dive spots. It can be a little eerie down there, but we promise it’ll be worth it! Blue Star is a program established by the Florida Keys National Marine Sanctuary to reduce the impact of divers and snorkelers on the coral reef ecosystem of the Florida Keys. It is a voluntary recognition program saluting charter boat operators who promote responsible and sustainable diving and snorkeling practices, helping keep the reef healthy for generations to come. Blue Star operators are committed to responsible tourism and go the extra step to educate their customers about the coral reef ecosystem, the Florida Keys National Marine Sanctuary, and diving and snorkeling etiquette. 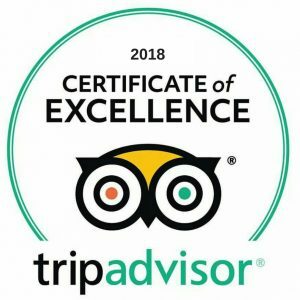 Founded in 2010, the Certificate of Excellence award honors hospitality businesses that consistently achieve outstanding traveler reviews on TripAdvisor. Properties that are awarded the Certificate of Excellence demonstrate hospitality excellence and represent the upper echelon of businesses listed on TripAdvisor, the world’s largest travel site. A property’s popularity ranking on TripAdvisor is also factored in. 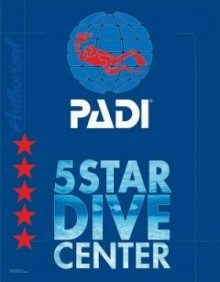 Being a PADI 5 Star Dive Center means we’re the best of the best when it comes to diving and snorkeling. PADI runs a tight ship and we work hard to maintain our status as a quality dive center. Properties that are awarded the Certificate of Excellence demonstrate hospitality excellence and represent the upper echelon of businesses listed on TripAdvisor, the world’s largest travel site. In other words, we’ve worked with a lot of people, and a lot of people love doing business with us! USE OUR ONLINE BOOKING SYSTEM TO GET STARTED! Pick the trip and click on the “Book Now” button.